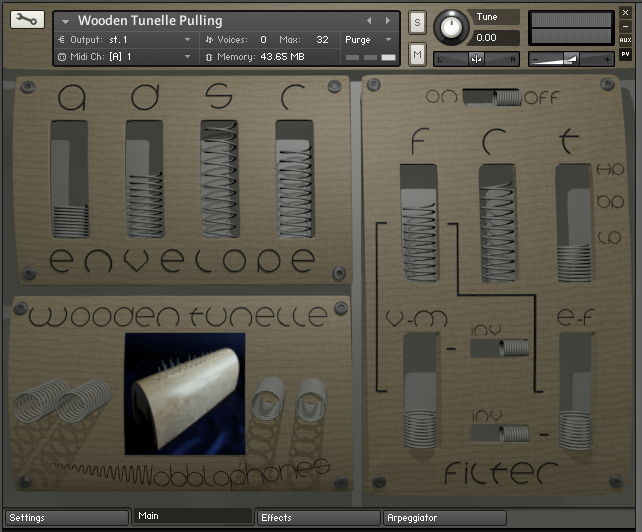 Tunelle is a Spring instrument. 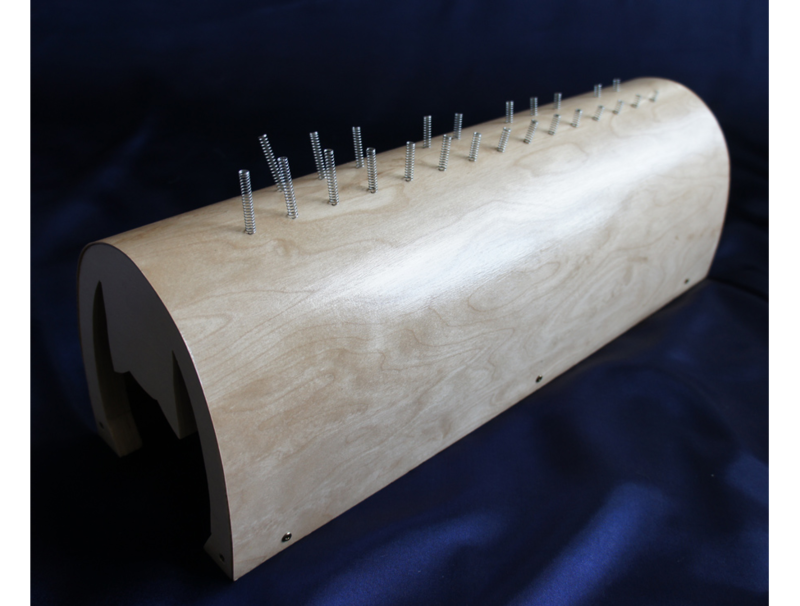 Its name is a contraction of two words that characterise this instrument sonically and visually: 'tuned tunnel'. Both of them hold two full octaves of chromatically arranged compression springs. 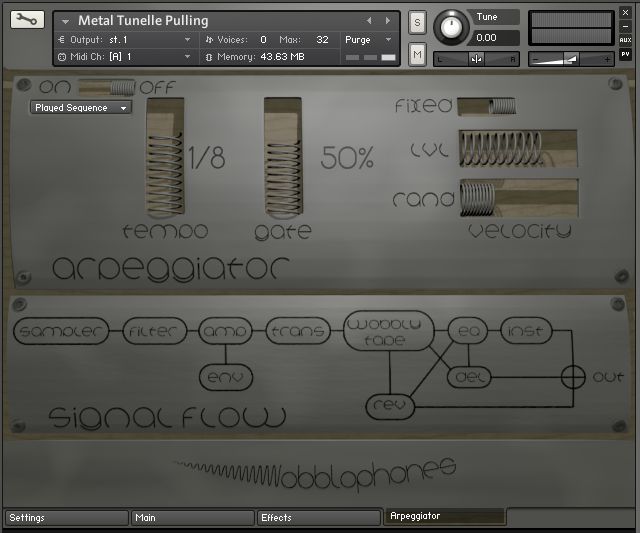 The different materials used for the resonating bodies are important factors for their resulting sonic characteristics. 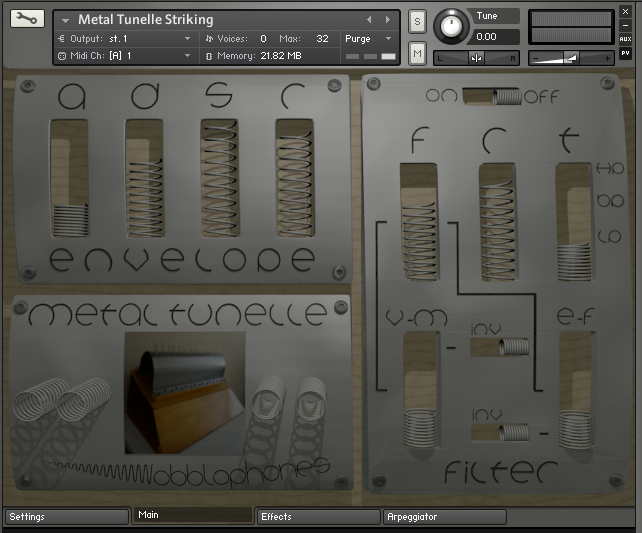 Metal Tunelle has a clear and long metallic ring, where as Wooden Tunelle has a more damped and warmer sound quality. Springs always ring in several pitches at the same time. Depending on the articulation used, different pitches of the same spring can be heard more or less clearly. 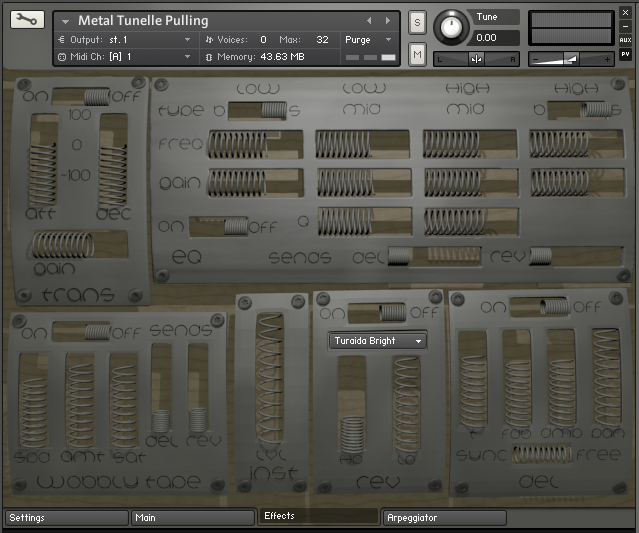 Tunelle was designed to be played mainly by pulling the springs with fingers and quickly releasing them, letting the springs wobble and resonate. Other articulations, such as horizontal plucking, vertical plucking, striking with a rubber mallet and plucking with a plectrum bring out friendly rattles that ring in distinct pitches. All demo tracks were made entirely with sounds from the Tunelle library. 2 GB of Tunelle samples (44.1 kHz, 24-bit). Installed size: approx. 895 MB using lossless ncw compression. Full version of Kontakt 5 required. 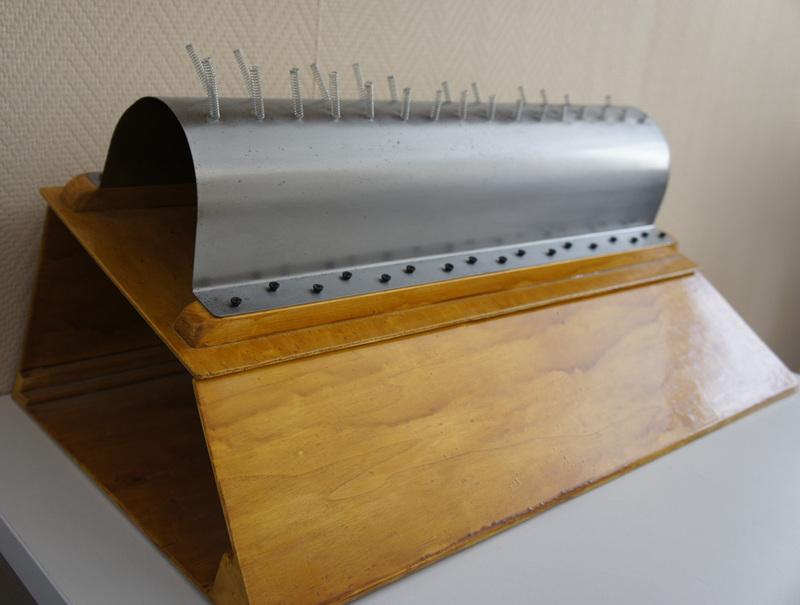 "This library doesn’t only offer a very unique instrument it also offers very unique sounds." "There is truly a unique sound from the Tunelle Library. Film Composers looking to expand their strange musical palette for atmospheric and eerie scenes, would have a field day with this library!" Wooden Tunelle's main panel has a more wooden look. Tunelle's settings panel allows you to setup the velocity response of the instrument and control how damping samples are used (damping samples are not available for all articulations). Wobbly Tape: Tape wobble detuning and saturation. 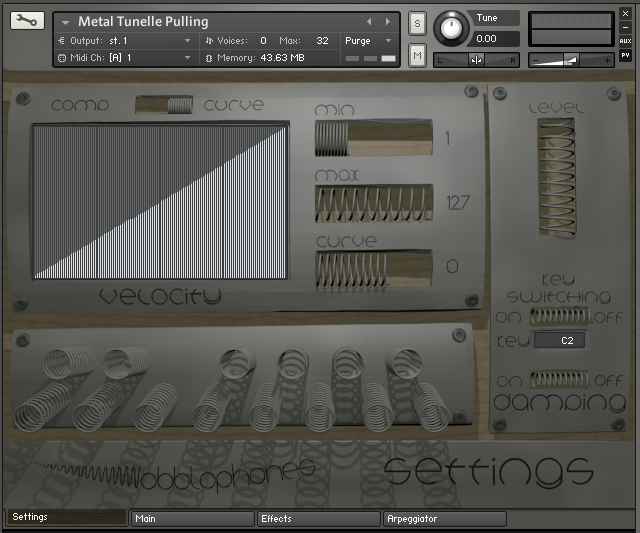 Tunelle's Arpeggiator panel is fun for creating some nice patterns (arpeggios) from chords that you are holding on the keyboard.